In Killer Whale and Crocodile carvers from two of the world’s great carving traditions come together. A First Nations carver from Canada travels into the jungles of Papua New Guinea and a New Guinea carver travels to urban Canada. Together, they share each other’s cultures and learn about the myths and legends that inform their individual artistic styles. 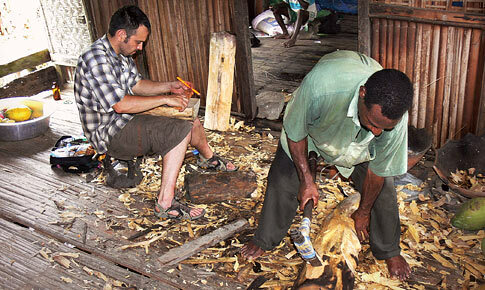 In the Spring of 2006 John Marston, a young Coast Salish carver from Vancouver Island who has already gained a strong reputation for his innovative approach to traditional Coast Salish styles, visited Teddy Balangu, a carver from the Sepik River of Papua New Guinea. Teddy returned to Canada where he was the artist in residence at the Museum of Anthropology at the University of British Columbia for 5 months. What strikes the eye as one looks from John’s art to Teddy’s is the similarity of forms and lines found in Coast Salish and Sepik River pieces. The Coast Salish carvings include killer whales, ravens and eagles; the Sepik pieces include crocodiles, cassowaries and hornbills. But both speak of culture, tradition and art. John and Teddy’s journeys would not have been possible without Elaine Monds, director of Alcheringa Gallery in Victoria, BC and Dr. Carol Mayer, Curator for Oceania and Africa at the Museum of Anthropology. Elaine has for many years championed the art of the Northwest Coast and the Sepik River. She is perhaps the only person in the world who sells the work of Papua New Guinea artists as the work of individual artists instead of cultural curios. Carol has long championed the arts of Oceania and Africa as living art traditions. The exchange inspires the most magnificent projects either of the carvers has ever undertaken. Killer Whale & Crocodile was produced and developed by Gumboot Productions Inc and Arthur Holbrook Productions Inc, in association with Bravo!, a division of CTVglobemedia. Copyright © 2007 Gumboot Productions Inc; all rights reserved. Website and graphic design by Rocketday.